Our Brewer’s Backyard Beer Jars! We’re celebrating Canada Day at our third Brewer’s Backyard event, entitled The Constitutional Draught which is taking place on holiday Monday, July 2nd from 12-4pm. This event marks the first time that we’re welcoming more than a single brewer to the Backyard, with three Toronto-based breweries bringing the goods. We’re happy to have Black Oak Brewing, Cheshire Valley Brewing and Kensington Brewing all a part of our event on Monday. And they’re all getting into the spirit of the summer season and Canada Day with a range of delicious beers to try. Kensington Brewing will be pouring their flagship Augusta Ale (soon to be available at the LCBO) plus a super-limited edition keg of the brand new Watermelon Wheat. Cheshire Valley is celebrating our national colours with an Irish Red and a White beer, alongside a new Citra IPA. And Black Oak will be bringing their Pale Ale, Summer Saison and recent collaboration Daily Bread Belgian Table Ale. We’re complementing this delicious beer with a couple of top-notch food vendors. Rock Lobster Food Co. will be serving both their Signature Lobster Rolls and Lobster Tacos and the Burger Bar will be offering Burger Tacos with Hop Mayo and Salsa Negra (both meat and veggie options available). 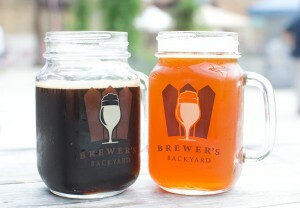 We also still have some of our limited edition Brewer’s Backyard beer jars (pictured above) available for sale. But when they’re gone, they’re gone! The Brewer’s Backyard runs from 12-4pm in the Koerner Gardens at the Evergreen Brick Works. You can get to the Brick Works a number of ways, including their shuttle bus from Broadview station, or a walk down from Chorley Park which is accessible on the Rosedale 82 bus. Our event is all ages, but 19+ to drink beer. Admission is free, and you can purchase tickets for beer and food at the event, and we will be accepting cash, Visa, MasterCard and debit as payment options. Follow us on Twitter for the latest news and information. We hope to see you there!